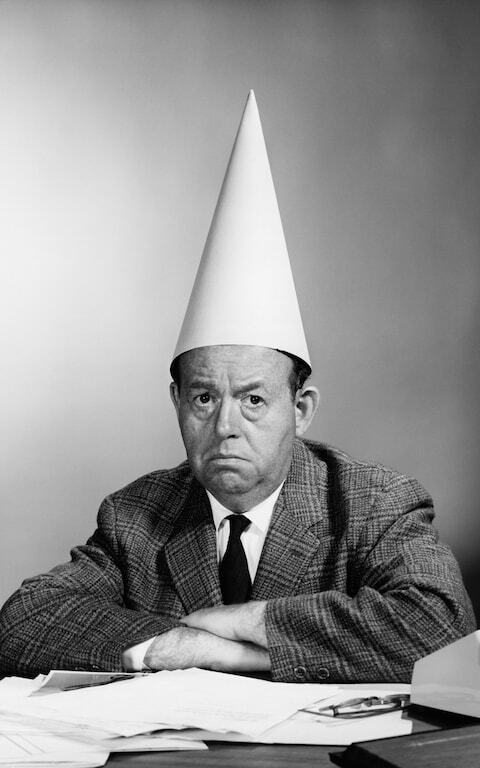 Tail Wags Dog: Dunces All! Back in February, in my post Call It Out: Crazies!, I coined the term I have been using for the irreconcilable Leavers in the Tory Party: Crazies. In the light of recent events, I’ve changed my mind – and my name for them. Here’s why. First, let’s take stock of where we are. 62 MPs signed a pre-emptive letter to Theresa May demanding the most inflexible arrangements (almost certainly unacceptable to the EU officials and EU27) for the UK and a customs union. That represents 20% of the Tory party and less than 10% of the membership of the House of Commons. Tail wags dog. May boxes herself into a position where she is beholden on these unrepresentative idiots, because of her extreme weakness and vulnerability as party leader. Inner “War Cabinet” kicks the can further down the road on a seamless border between the Irish Republic and Northern Ireland. The EU deadline was 18 April for the UK to come up with a solution. Two years wasted. In short, government paralysis, led by the most stubborn, useless Prime Minister in my lifetime. All credible options involving leaving the EU still worse than the status quo. How did we get into such a mess, with the UK a laughing-stock? The EU27 view us with a mixture of frustration (for not knowing what “we” want) and pity. So, let’s clarify my new name for the people who are being allowed by May to hold us to ransom. D is for Deluded. Specifically, I’m referring to the post-imperial, nostalgic seekers after Empire 2.0, largely based upon the old white Commonwealth: racist as well as deluded. U is for Unhinged. I don’t go in for cod-psychology. But the mind-set required to deny reality smacks of elements of mental illness. N is for Nasty. May has, ironically, fulfilled her earlier warning and prediction: the Tories are now a fully-fledged Nasty Party, extending far beyond the Windrush generation. Hasn’t everyone noticed yet? C is for Crazy. Still crazy after all these weeks, as I said in February. E is for Europhobic. These people see the EU and our nearest neighbours as the enemies. I see them as our closest friends internationally, with whom we share the most values. This Europhobic disease is usually associated with an unhealthy addiction to the mythical “special relationship” with the USA. Is there anyone sane who would want a special relationship with Donald J Trump? So my new acronym is to call these people Dunces. How about a little game: some key politicians and my assessment of their DUNCE scores (marks out of 5). Liam Fox: 5+5+5+5+5=25: no trade deals signed yet, or for the foreseeable future. Boris Johnson: 3+2+5+3+3=16: hard to assess, as his Trump-lite narcissism heavily disguises his true motives. Theresa May: 2+1+5+0+5=13. The final 5 is based upon her actions since taking over as PM, not on the fact that she was a (shy) Remainer in the vote. Jeremy Corbyn: 0+0+0+0+3=3. Corbyn has never fully shaken off his Eurosceptic approach; practically the whole of the Labour Party’s MPs would score a total of 0 to 1 points. Opportunity missed? Keir Starmer: 0+0+0+0+0=0. Saw him at Cambridge when he was DPP. Sane, rational, best man to present Labour’s position (but not necessarily as Party leader). So where does this leave us? In a fine mess. Let’s see what the local election results and a few more defeats in the Lords – and Commons – do for us. We live in unprecedented times. In the meantime, don’t let the Dunces destroy all we progressives value in Britain!